What is the Tea Party waving, exactly? Sometimes, especially in moments of national stress, one American flag isn’t enough to wrap around the country’s multiple points of view. 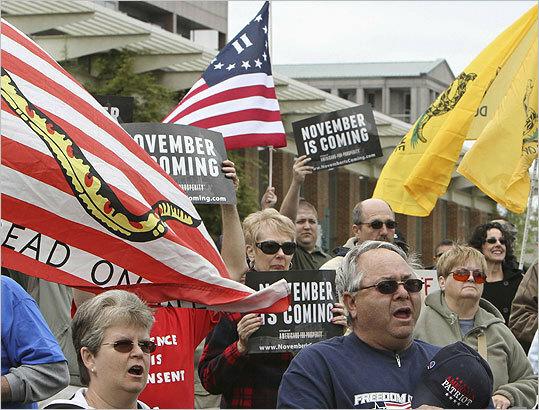 As the Tea Party rallies have spread around the country this past year, they’ve brought with them a profusion of flags far beyond the usual Stars and Stripes. There’s been plenty of red, white, and blue at Tea Party events, certainly — but some of it is in different patterns than usual. Other flags are black and white; still others are bright yellow. There are letters and numbers and words in the mix. Also rattlesnakes. Lots of rattlesnakes. The standard American flag may be the paramount symbol of our country, but it’s not the only flag we’ve known, nor is it the oldest. Flag Day itself, June 14, secretly commemorates the flag’s complicated history — it wasn’t until 1777 that the Continental Congress wrote down a description of what the flag should be. In the meantime, the Colonists had been fighting the British under whatever banner happened to be handy: regimental flags, homemade insignia, green, blue, what-have-you. Today, if Barack Obama and Nancy Pelosi are using the Stars and Stripes as the backdrop to the State of the Union address, oppositional patriotism demands some other flag to wave. For protesters upset at the current government, but still feeling patriotic, there’s a whole alternative iconography to choose from. “Far and away, the biggest thing is the Gadsden,” said Rick Wyatt, who runs a flag store in Glen Burnie, Md. That’s the triple-coiled brown rattlesnake baring its fangs, on a yellow background and the legend DONT TREAD ON ME. Named for South Carolina Continental Congress delegate Christopher Gadsden, it was flown by the newly launched American Navy in 1775. Last year, Wyatt said, his Gadsden flag inventory started evaporating, a year’s worth of sales coming in a day. “Then you call the manufacturers, they’re all out,” he said. Some Tea Party participants prefer to use something other than the symbols of the past. Photographs of Scott Brown’s victory party at the Park Plaza captured rows of people waving an unorthodox flag: a Betsy Ross design, but with a big white Roman numeral “II” in the middle of the ring of stars. This one is new, a flag deliberately designed last year to invoke American Revolution, the Sequel. “It’s kind of like ‘Rocky,’ ‘Rocky II,’ ‘Rocky III’,” said Jeff McQueen, who designed the flags. McQueen, who lives in Rochester, Mich., said he joined the Tea Party after getting laid off from a job marketing automobile exterior mirrors overseas. He thought about flying an American flag upside down at rallies — a signal of nautical distress that some Tea Party members use to show political distress — but he thought it would seem disrespectful to veterans. He considered the Gadsden flag, he said, but it seemed a “symbol of anger.” Also, the Gadsden flags he saw were made in China. Instead, he came up with his own design, and ordered a batch from a company in Humble, Texas. Since then, he said, he’s gone through more than 10,000 flags, filling orders from all 50 states. For the Brown campaign, he packed a bunch of his Flags of the Second American Revolution in his 2008 Bullitt Ford Mustang and drove east. At the Park Plaza, he said, he scavenged a press pass and used it to get into the hall, where he handed out his flags to people in the front row, where the cameras would catch them. “As we learned with ‘The Da Vinci Code,’ there are certain symbols that resonate with us,” McQueen said. Some people took the numerals to be the Twin Towers; other people thought they represented the Second Amendment. “Everybody kind of saw in this symbol what they wanted to see in this symbol,” McQueen said. Tom Scocca writes the blog ”Scocca” for Slate.com. His first book, Beijing Welcomes You, will be published by Riverhead in 2011.